Elite magic circle player Slaughter and May has announced an autumn retention score of 86%. Out of the 37 trainees due to qualify later this year, 32 have committed their futures to the firm and will be taking up newly qualified (NQ) associate roles. The Bunhill Row bunch confirmed it received 35 applications and made 33 offers. It didn’t provide details of the departments its new recruits will qualify into. Legal Cheek’s Firms Most List shows Slaughters’ newbies will see their pay rise from a second-year trainee salary of £49,000 to a base rate of £80,000 upon qualification, a healthy uplift of £31,000 or 63%. The firms newest recruits receive a salary of £44,000 in year one of their training. The magic circle player is one of the more consistent retention performers. Earlier this year, it reported a spring score of 95% (35 out of 37), while the round before that saw Slaughters’ chalk up a result of 91% (29 out of 32). But what’s life as a lawyer like at the firm? In Legal Cheek’s Trainee & Junior Lawyer Survey, Slaughters notched up As for quality of work, training, peer support, perks and office. The firm — which offers around 80 training positions annually — scored Bs for work/life balance, tech, canteen and social life. Slaughter and May is now the second magic circle firm to publish its autumn score. Last week, Clifford Chance confirmed a result of 77% or 36 out of 47. Any word on where those not retained are headed? The best trainees, if they can, often leave and switch to US firms. A Slaughters trainee should have no problem finding another position. My trainee regularly tries new positions. 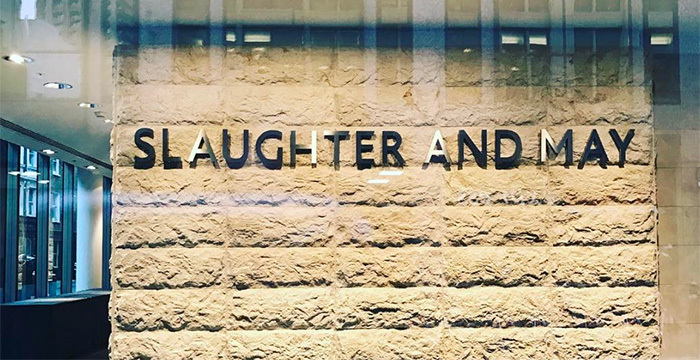 Slaughter and May is easily the finest London-headquartered law firm in the world. Best TC opportunity in the City. I remember one Slaughters guy in particular on my LPC intake studied social sciences at somewhere incredibly average like Leicester or Lancaster. He used to prance around BPP like he was Lord Sumption. He had a huge superiority complex. Ultimately, Slaughters is just a good law firm. It’s not like the average Slaughters trainee is any better than any other good City firm. I could perhaps understand that attitude from say a chancery/commercial tenant at a very good set (the real elite of the English legal profession). Otherwise, you work at a law firm like so many others. Get over yourself. Lol, does Lord Sumption prance around? If he went to Leicester or Lancaster, he wasn’t a Slaughter and May trainee*. I suspect you’ve been had, my son. *unless Leicester and Lancaster are hitherto unknown Oxbridge colleges. I didn’t get it but I had an interview at Slaughter & May, and other MC firms, and I went to the University of Aberdeen. Away with you, toff. The clue is that you didn’t get it. They have to be seen to interview diverse people so they can say the Oxbridge types were simply “better candidates” and therefore they selected “solely on merit”. Quite. If you went to Aberdeen, you are, by definition, stupid – and badly educated. I went to Aberdeen cause I was 16 going to University and my parents lived there because of the oil industry lol. LOL and its lagging about £60,000 behind top of the market at NQ level (excluding bonuses). The bottom line is all that matters. You wish you were the assistant janitor at Bunhill Row, you tedious little peasant. The most incongruous part of this story is that the best man chose Bordeaux as a stag do location. Who’d go to Bordeaux? That is really disrespectful Dennis – why would you go to a stag do over your sister’s funeral?! All female rejects welcome at Jones Day.